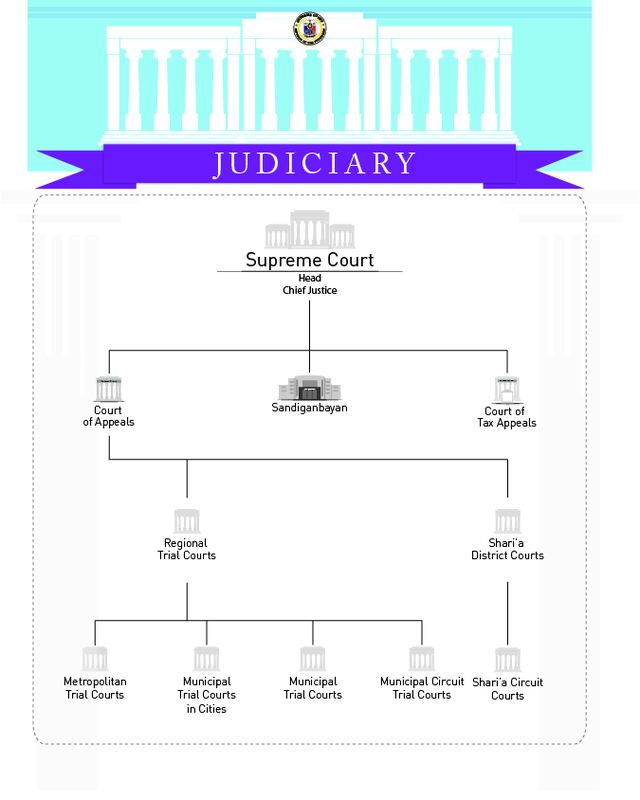 Judicial power rests with the Supreme Court and the lower courts, as established by law (Art. VIII, sec. 1 of the 1987 Constitution). Its duty is to settle actual controversies involving rights which are legally demandable and enforceable (Art. VIII Sec. 1 (2)). The judiciary enjoys fiscal autonomy. Its appropriation may not be reduced by the Legislature below the appropriated amount the previous year (Art. VIII, Sec. 3). The Rules of Court of the Philippines, as amended and the rules and regulations issued by the Supreme Court, define the rules and procedures of the judiciary. These rules and regulations are in the form of administrative matters, administrative orders, circulars, memorandum circulars, memorandum orders, and OCA circulars. The Supreme Court disseminates these rules and regulations to all courts, publishes important ones in newspapers of general circulation, prints them in book or pamphlet form, and uploads them to the Supreme Court website and the Supreme Court E-Library website. On June 21, 1988, the Supreme Court promulgated the Code of Professional Responsibility for the legal profession. The draft was prepared by the Committee on Responsibility, Discipline and Disbarment of the Integrated Bar of the Philippines. By virtue of Article VIII, Section 8, appointments to the judiciary are made by the President of the Philippines based on a list submitted by the Judicial and Bar Council which is under the supervision of the Supreme Court. Its principal function is to screen prospective appointees to any judicial post. 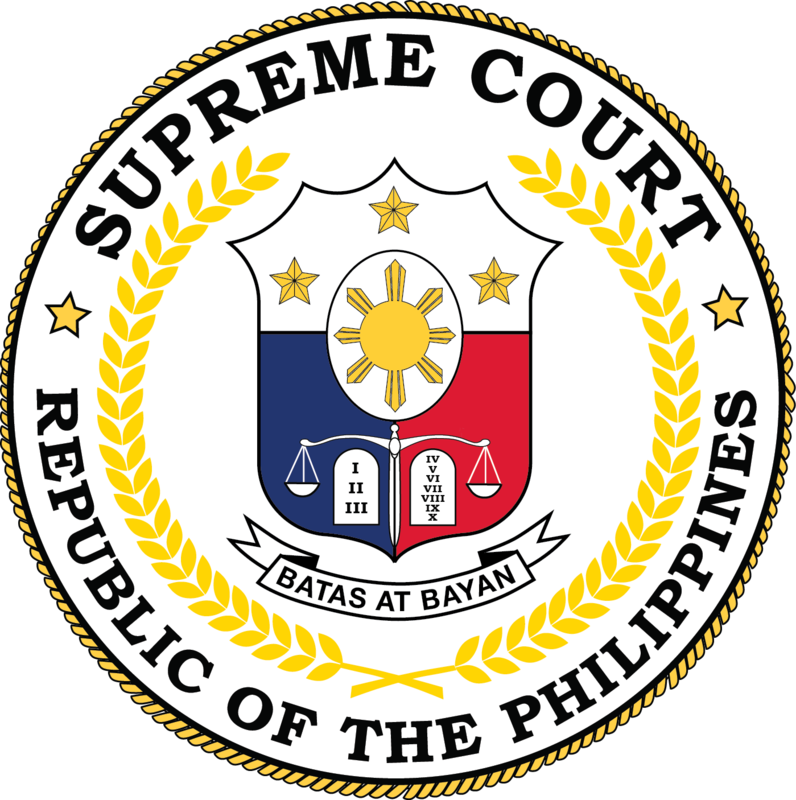 It is composed of the chief justice as ex-officio chairman, the Secretary of Justice and representatives of Congress as ex-officio members, and a representative of the Integrated Bar, a professor of law, a retired member of the Supreme Court and a representative of the private sector as members. The Philippine Judicial Academy (PHILJA) is the “training school for justices, judge, court personnel, lawyers and aspirants to judicial posts.” It was originally created by the Supreme Court on March 16, 1996 by virtue of Administrative Order No. 35-96, and was institutionalized on February 26, 1998 by virtue of Republic Act No. 8557. No appointee to the bench may commence the discharge his adjudicative function without completing the prescribed court training in the academy. Its organizational structure and administrative setup are provided for by the Supreme Court in its en banc resolution (Revised A.M. No. 01-1-04-sc-PHILJA). The Philippine Mediation Center was organized pursuant to the en banc Supreme Court Resolution A.M. No. 01-10-5-SC-PHILJA, dated October 16, 2001, and in line with the objectives of the Action Program for Judicial Reforms (APJR) to decongest court dockets, among others, the court prescribed guidelines in institutionalizing and implementing the mediation program in the Philippines. The same resolution designated the Philippine Judicial Academy as the component unit of the Supreme Court for Court-Annexed Mediation and other Alternative Dispute Resolution (ADR) mechanisms, and established the Philippine Mediation Center (PMC). Mandatory Continuing Legal Education Office was organized to implement the rules on Mandatory Continuing Legal Education for members of the Integrated Bar of the Philippines (B.M. No. 850 – “Mandatory Continuing Legal Education (MCLE)). It holds office in the Integrated Bar of the Philippines main office. Presidential Decree No. 1508, or the Katarungang Pambarangay Law, took effect on December 11, 1978, and established a system of amicably settling disputes at the barangay level. This decree and the Local Government Code provided rules and procedures, Title I, Chapter 7, Sections 339-422. This system of amicable settlement of dispute aims to promote the speedy administration of justice by easing the congestion of court dockets. The court does not take cognizance of cases filed if they are not filed first with the Katarungang Pambarangay. The royal audencia was established on May 5, 1583, composed of a president, four oidores (justices) and a fiscal. The audencia exercised both administrative and judicial functions. Its functions and structure were modified in 1815 when a chief justice replaced its president and the number of justices was increased. It came to be known as the Audencia Territorial de Manila with two branches, civil and criminal. A royal decree issued on July 24, 1861 converted it to a purely judicial body with its decisions appealable to the Court of Spain in Madrid. A territorial audencia in Cebu, and audencia for criminal cases in Vigan were organized on February 26, 1898. In the three phases of the revolution: 1896-1897; 1898; 1899-1901, the exigencies of war prevented the thorough organization of the administration of justice. Katipunan councils, then the provisional governments of Tejeros, Biak-na-Bato, and the Revolutionary Republic proclaimed in Kawit, essentially had General Emilio Aguinaldo exercising decree-making powers instituting ad hoc courts and reviewing any appeals concerning their decisions. In 1899, when the Malolos Constitution was ratified, it provided for a Supreme Court of Justice. President Aguinaldo proposed the appointment of Apolinario Mabini as Chief Justice, but the appointment and the convening of the Supreme Court of Justice never materialized because of the Philippine-American War. During the Philippine-American War, General Wesley Merrit suspended the audencias when a military government was established after Manila fell to American forces in August, 1898. Major General Elwell S. Otis re-established the Audencia on May 29, 1899 by virtue of General Order No. 20, which provided for six Filipino members of the audencia. With the establishment of civil government, Act No. 136 of the Philippine Commission abolished the audencia and established the present Supreme Court on June 11, 1901, with Cayetano Arellano as the first chief justice together with associate justices—the majority of whom were Americans. With the ratification of the 1935 Constitution, the membership was increased to 11 with two divisions of five members each. The Supreme Court was Filipinized upon the inauguration of the Commonwealth of the Philippines on November 15, 1935. The composition of the court was reduced by virtue of Commonwealth Act No. 3. It provided for a Supreme Court, headed by a chief justice with six associate justices. During World War II, the National Assembly passed legislation granting emergency powers to President Manuel L. Quezon; Chief Justice Jose Abad Santos was made concurrent Secretary of Justice and acting President of the Philippines in unoccupied areas. After his capture and execution at the hands of the Japanese, the Commonwealth government-in-exile had no system of courts. Meanwhile, the Japanese organized the Philippine Executive Commission in occupied areas on January 8, 1942, which gave way to the Second Republic in October 14, 1943. By the end of World War II, the regular function of the courts had been restored, beginning with the appointment of a new Supreme Court on June 6, 1945. On September 17, 1945, the laws of the Second Republic were declared null and void; a Supreme Court decision on Co Kim Cham v. Eusebio Valdez Tan Keh and Arsenio P. Dizon recognized this. The process by which a chief justice and associate justices are appointed was changed under to grant the president (Ferdinand Marcos during this time) the sole authority to appoint members of the Supreme Court. There were five chief justices that were appointed under this provision. Pursuant to the provisions of the 1987 Constitution, the Supreme Court is composed of a chief Justice and 14 associate justices who serve until the age of 70. The court may sit en banc or in one of its three divisions composed of five members each. The chief justice and associate justices are appointed by the President of the Philippines, chosen from a shortlist submitted by the Judicial and Bar Council. The president must fill up a vacancy within 90 days of occurrence. Article VIII, Section 4 (2) of the constitution explicitly provides for the cases that must be heard en banc, and Section 4 (3) for cases that may be heard by divisions. The Judiciary Reorganization Act of 1980 transferred the administrative supervision of all courts and their personnel from the Department of Justice to the Supreme Court. This was affirmed by Article VIII, Section 6 of the 1987 Constitution. To effectively discharge this constitutional mandate, the Office of the Court Administrator (OCA) was created under Presidential Decree No. 828, as amended by Presidential Decree No. 842 (and its functions further strengthened by a resolution of the Supreme Court en banc dated October 24, 1996). Its principal function is the supervision and administration of the lower courts throughout the Philippines and all their personnel. It reports and recommends to the Supreme Court all actions that affect the lower court management. The OCA is headed by the court administrator, three deputy court administrators, and three assistant court administrators. Exercise jurisdiction over cases affecting ambassadors, other public ministers and consuls, and over petitions for certiorari, prohibition, mandamus, quo warranto, and habeas corpus. Assign temporarily judges of lower courts to other stations as public interest may require. Such temporary assignments shall not exceed six months without the consent of the judge concerned. Promulgate rules concerning the protection and enforcement of constitutional rights, pleading, practice, and procedure in all courts; the admission to the practice of law, the Integrated Bar; and legal assistance to the underprivileged. Such rules shall provide a simplified and inexpensive procedure for the speedy disposition of cases, shall be uniform for all courts the same grade, and shall not diminish, increase or modify substantive rights. Rules of procedure of special courts and quasi-judicial bodies shall remain effective unless disapproved by the Supreme Court. Appoint all officials and employees of the Judiciary in accordance with the Civil Service Law (Sec. 5 , id.). The position of chief justice was created in 1901 by virtue of the establishment of the Philippine Supreme Court. At the time, the chief justice was appointed by the President of the United States: the court was composed mainly of American citizens with a Filipino chief justice. 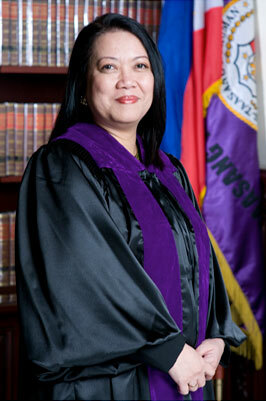 The incumbent Chief Justice, Ma. Lourdes P.A. Sereno, appointed by President Benigno S. Aquino III, took her oath of office on August 25, 2012. She is the first woman to hold the position. There were six chief justices appointed by the President of the United States. In 1935, upon the inauguration of the Commonwealth of the Philippines, the power to appoint the chief justice was transferred to the President of the Philippines. According to the 1935 Constitution, the President of the Philippines shall make appointments with concurrence of the National Assembly. There have been six Chief Justices who were appointed under the 1935 Constitution. The only chief justice that was not appointed by a president was Chief Justice Jose Yulo, who was in office during the Japanese occupation, from 1942 until the liberation of the Philippines in 1945. During this time, the Chief Justice of the Supreme Court was appointed by the Philippine Executive Committee headed by Jorge B. Vargas. The 1943 Constitution provided for the members of the Supreme Court and the chief justice to be appointed by the president with the concurrence of his cabinet. Upon the declaration of martial law and the subsequent establishment of the 1973 Constitution, the process of selection of the Chief Justice of the Philippines was changed. The power of Congress to veto an appointment by the president to the office of the chief justice was removed. According to the 1973 Constitution, “The Members of the Supreme Court and judges of inferior courts shall be appointed by the President.” There were five chief justices that were appointed under this provision. After the revolution of 1986, a new constitution was enacted and a new process of selecting a chief magistrate was created. Former chief justice and 1986 Constitutional Commission delegate Roberto V. Concepcion introduced the concept of the Judicial and Bar Council. The aim of the Council is to de-politicize the judiciary by lessening the appointing power of the president. To read more about the appointment of chief justices, members of the judiciary, and the Office of the Ombudsman, please click here. To date, there have been nine chief justices appointed under the conditions of the 1986 Constitution. Of the 15 Presidents of the Philippines, only eight have been able to appoint an individual to the highest judicial post in the land. The following is the list of presidents who appointed chief Jjstices and their appointees. Of the list of chief justices, there are a few individuals that stand out for having gone above and beyond their duty and tenure as chief justice. Cayetano Arellano: Cayetano Arellano was the first Chief Justice of the Supreme Court. He was appointed in 1901 when the Supreme Court was created through Act No. 136, along with three American justices and one Filipino justice. Ramon Avanceña: Appointed in 1925 by U.S. President Calvin Coolidge, he is known for ushering in an all-Filipino Supreme Court in 1935. Upon the establishment of the Philippine Commonwealth in 1935, American justices were no longer allowed to sit in the Philippine Supreme Court—thus, new justices were appointed, all of whom were of Filipino citizenship. Manuel V. Moran: Appointed in 1945 by President Sergio Osmeña, Manuel V. Moran would serve as Chief Justice of the Supreme Court for six years. Upon his retirement in 1951, Moran was appointed as Philippine Ambassador to Spain and concurrently to the Holy See. During President Quirino’s administration, Moran was once again offered a position in the Supreme Court in 1953, at the twilight of Quirino’s presidency. Moran, however, refused the midnight appointment. Roberto V. Concepcion: He went into early retirement for refusing to grant absolute power to Ferdinand Marcos, the president who appointed him. In the resolution of Javellana v. Executive Secretary, Concepcion argued against the validity of the 1973 Constitution and its questionable aspects. Accordingly, he dissented, along with Justices Teehankee, Zaldivar, and Fernando, from implementing the 1973 Constitution. Due to the court’s decision, Concepcion would enter early retirement, 50 days before his originally scheduled retirement date. Hilario G. Davide: Appointed by President Joseph Ejercito Estrada in 1998, Chief Justice Hilario G. Davide was known as the presiding judge of the first impeachment proceedings in Asia. 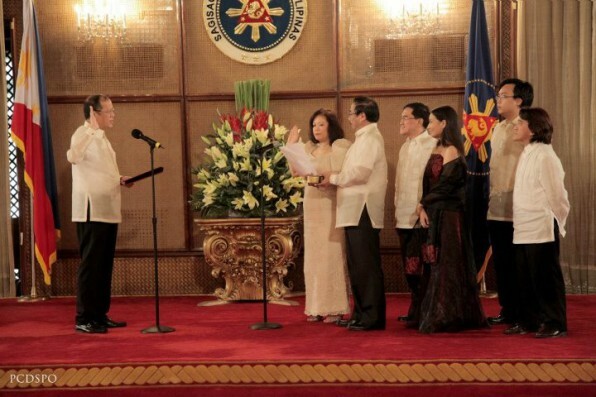 During the impeachment of President Estrada, he conducted proceedings with impartiality. Following EDSA II uprising, which deposed President Estrada, Davide swore in Gloria Macapagal-Arroyo as the 14th President of the Philippines. Maria Lourdes P.A. Sereno: Appointed by President Benigno S. Aquino III in 2012, Chief Justice Sereno is the first woman appointed to the position. The Court of Appeals is the second highest tribunal in the country, which was established on February 1, 1936 by virtue of Commonwealth Act No. 3. The current form of the Court of Appeals was constituted through Batas Pambansa Blg. 129, as amended by Executive Order No. 33, s. 1986, Republic Act No. 7902, and Republic Act No. 8246. Exclusive appellate jurisdiction over all final judgements, resolutions, orders or awards of Regional Trial Courts and quasi-judicial agencies, instrumentalities, boards or commission. The Court of Appeals shall also have the power to try cases and conduct hearings, receive evidence and perform acts necessary to resolve factual issues raised in cases falling within its original and appellate jurisdiction, including the power to grant and conduct new trials or proceedings. The Court of Appeals is composed of one presiding justice and 68 associate justices, all of which are appointed by the President from a shortlist submitted by the Judicial and Bar Council. The associate justices shall have precedence according to the dates (or order, in case of similar appointment dates) of their respective appointments. 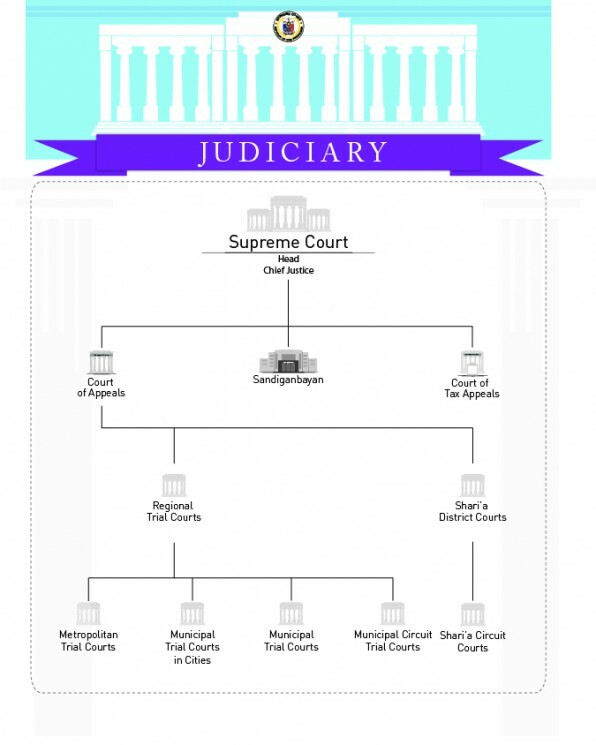 The qualifications for the justices of the Supreme Court also apply to members of the Court of Appeals. The current presiding justice of the Court of Appeals is Andres Reyes Jr., who is set to retire on May 11, 2020. The Court of Tax Appeals (CTA), which is of the same level as the Court of Appeals, was created by virtue of Republic Act No. 1125, which was signed into law on June 16, 1954. Its present-day form was constituted through RA 1125, as amended by Republic Act No. 9282 and Republic Act No. 9503. Decisions of the Secretary of Trade and Industry, in the case of non-agricultural product, commodity or article, and the Secretary of Agriculture in the case of agricultural product, commodity or article, involving dumping and countervailing duties under Section 301 and 302, respectively, of the Tariff and Customs Code, and safeguard measures under Republic Act No. 8800, where either party may appeal the decision to impose or not to impose said duties. Exclusive original jurisdiction over all criminal offenses arising from violations of the National Internal Revenue Code or Tariff and Customs Code and other laws administered by the Bureau of Internal Revenue or the Bureau of Customs: Provided, however, that offenses or felonies mentioned in this paragraph where the principal amount of taxes and fees, exclusive of charges and penalties, claimed is less than P1 million or where there is no specified amount claimed shall be tried by the regular courts and the jurisdiction of the CTA shall be appellate. Over appeals from the judgments, resolutions or orders of the Regional Trial Courts in tax cases originally decided by them, in their respective territorial jurisdiction. Over petitions for review of the judgments, resolutions or orders of the Regional Trial Courts in the exercise of their appellate jurisdiction over tax cases originally decided by the Metropolitan Trial Courts, Municipal Trial Courts and Municipal Circuit Trial Courts in their respective jurisdiction. Exclusive original jurisdiction in tax collection cases involving final and executory assessments for taxes, fees, charges and penalties: Provided, however, that collection cases where the principal amount of taxes and fees, exclusive of charges and penalties, claimed is less than P1 million shall be tried by the proper Municipal Trial Court, Metropolitan Trial Court and Regional Trial Court. Over appeals from the judgments, resolutions or orders of the Regional Trial Courts in tax collection cases originally decided by them, in their respective territorial jurisdiction. Over petitions for review of the judgments, resolutions or orders of the Regional Trial Courts in the Exercise of their appellate jurisdiction over tax collection cases originally decided by the Metropolitan Trial Courts, Municipal Trial Courts and Municipal Circuit Trial Courts, in their respective jurisdiction. The CTA is composed of one presiding justice and 8 associate justices, all of which are appointed by the President from a shortlist submitted by the Judicial and Bar Council. The associate justices shall have precedence according to the dates (or order, in case of similar appointment dates) of their respective appointments. The qualifications for the justices of the Court of Appeals also apply to members of the CTA. The current presiding justice of the CTA is Roman del Rosario, who is set to retire on October 6, 2025. To attain the highest norms of official conduct among officials and employees in the government, the creation of a special graft court to be known as the Sandiganbayan was provided for in Article XIII, Section 5 of the 1973 Constitution. This court was formally established through Presidential Decree No. 1606, which was signed into law on December 10, 1978. Through Article XI (Accountability of Public Officers), Section 4 of the 1987 Constitution, the Sandiganbayan was carried over to the post-EDSA Revolution republic. The current form of the Sandiganbayan was constituted through PD 1606, s. 1978, as amended by Republic Act No. 7975 and Republic Act No. 8245. All other national and local officials classified as Grade 27 and higher under the Compensation and Position Classification Act of 1989. Other offenses or felonies whether simple or complexed with other crimes committed by the public officials and employees mentioned in subsection a of this section in relation to their office. Civil and criminal cases filed pursuant to and in connection with Executive Order Nos. 1, 2, 14 and 14-A, s. 1986. In addition, the Sandiganbayan exercises exclusive appellate jurisdiction over final judgments, resolutions or orders or regional trial courts whether in the exercise of their own original jurisdiction or of their appellate jurisdiction as herein provided. The Sandiganbayan also has exclusive original jurisdiction over petitions for the issuance of the writs of mandamus, prohibition, certiorari, habeas corpus, injunctions, and other ancillary writs and processes in aid of its appellate jurisdiction and over petitions of similar nature, including quo warranto, arising or that may arise in cases filed or which may be filed under Executive Order Nos. 1,2,14 and 14-A issued in 1986. In case private individuals are charged as co-principals, accomplices or accessories with the public officers or employees, including those employed in govemment-owned or controlled corporations, they shall be tried jointly with said public officers and employees in the proper courts which shall exercise exclusive jurisdiction over them. The Sandiganbayan comprises of one presiding justice and 14 associate justices, all of which are appointed by the President from a shortlist submitted by the Judicial and Bar Council. The associate justices shall have precedence according to the dates (or order, in case of similar appointment dates) of their respective appointments. has been a judge of a court for at least ten years, or been engaged in the practice of law in the Philippines or has held office requiring admission to the bar as a prerequisite for at least ten years. The current presiding justice of the Sandiganbayan is Amparo Cabotaje-Tang, who is set to retire on November 8, 2024.